Getting this post out to you early because today's gonna be a long busy one for me...I'm working a 12+ hour shift today at my "real" job...I'm out of practice with these since I've been doing 8 hour shifts for the past 10 or so years. Oh well, helping out where I can. Anyway, I promised you a second example using the Endless Birthday Wishes and so here it is! Ta Da! 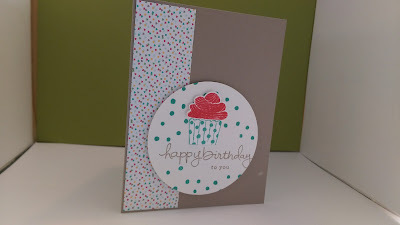 This one I did bring in another stamp set, the cupcake and the cupcake builder punch, but the Happy Birthday to you and the speckles are all from the Endless Birthday Wishes. And the DSP is also from the Cherry on Top DSP stack. So again, just a few supplies and viola! you have a completely different birthday card. Again, I used the Tip Top Taupe CS cut at 5 1/2" x 8 1/2" scored at 4 1/4" for the card base. I then cut a 1 1/2" x 5 1/2" strip from one of the designs from the DSP stack, Cherry on Top and adhered that down to the card base using Fast Fuse adhesive (I love Fast Fuse!) Then, using the Circle framelits collection, using the 5th circle counting outward from the center, I cut a circle from Whisper White CS. I used scraps to stamp the cupcake using Watermelon Wonder for the "frosting" and Bermuda Bay for the bottom and punched out the pieces using the Cupcake Builder punch and adhered them to the circle using Stampin' Dimensionals. I then inked up the script "happy birthday" with Tip Top Taupe ink and stamped it under the cupcake, then I inked up the print "to you" and stamped that below the "happy birthday". Finally, I inked up the little "dots" in the Endless Birthday Wishes stamp set with Bermuda Bay ink and stamped it randomly around the circle. I then adhered the circle to the card base using Stampin' Dimensionals. Again, very easy, a few coordinating supplies and you can have a cute card to give to a birthday "buddy"